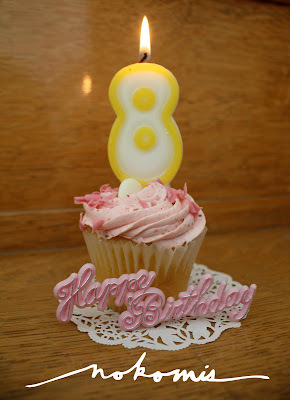 nokomis clothing: We're Eight Party! Join us on Thursday, September 9th for our 8th birthday party! We'll be celebrating from 4-9 pm, with lots of treats to snack on, drinks to sips and discounts to tempt to you! All new fall stock will be 20% off for one night only. We've received new Eve Gravel, Dagg & Stacey, Birds of North America, Preloved and more! Also, in honour of our 8 years, we'll be giving away 8 nokomis gift certificates. All you have to do is guess how many jelly beans are in the jar. You'll receive a ballot with every purchase you make that evening. The 7 closest guesses will win a $50 noko gift certificate. And the absolute closest will win a $100 noko gift certificate and a Kevin Murphy Screen Siren Kit courtesy of The Beauty Parlour. Fun, huh? See you soon! Wishing you a happy birthday from Japan! Love you girls and ze clothes! jewels for necks, fingers and wrists!